The FlatOut Race Series (FORS) is finally back in action with the start of the 2017 season. 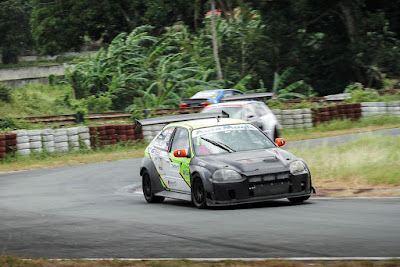 Round 1 got away to a good start on the 18th of March at the Batangas Racing Circuit (BRC). A total of 91 entries slugged it out on track in the Time Attack and Grid Races, proving plenty of action throughout the day. It was run under varied conditions in the dry. Weather constantly fluctuated by the hour, where huge shifts in track temperature made it more challenging for the top competitors to set a good lap. But not for Rafael la O' in the #1 Honda Civic EK who set the best time of the day for Time Attack running GT Radial SX2 tires. He also looked to be in contention for a win in the GT Radial Grid A race and came 2nd behind race winner Don Don Portugal. Rafael la O' logged a 1:48.725 lap, which was enough for him to bag the Bracket R and Bracket A victories. Eduardo Suiza in the #200 W-Autosport / Staging Lanes Honda Civic EG came 2nd in both classes with his best time of 1:48.880. In 3rd was Dondon Portugal who recorded a 1:49.939 on his last timed run. Ed Christian Go's newly-built #189 Honda Civic EG topped the time sheet in Bracket B with a 1:56.016 lap. Aaron Lao was 2nd with his 1:56.347 best, while Andrew De Asis was 3rd with a time of 1:56.424. Lady driver Kathy Villar was the highlight of Bracket C when she outpaced all the men, recording a best time of 1:59.083. In 2nd was Team Nawna Racing's 12-year-old Miggy Sohu who set a 1:59.473 lap. The highest-placed adult male was Paul Santos in 3rd with his 2:00.054. The fastest names in Bracket D were Zak Mendoza in 1st, Arbie Jacinto in 2nd, and John Benedict Carbonel in 3rd who were all within a tenth of a second of each other. As for Bracket E, the top finishers were Alain Matias, Bernard Michael Santos, and Mars Ocampo placing 1st, 2nd, and 3rd, respectively. Ronn Catindig was in a league of his own in Bracket F with his near-perfect 2:08.079 lap. 2nd was Greg Suing and 3rd was Robert Tan. With 10 entries, Bracket G was the easily the biggest class of the day. Ralph Tan was the fastest of them all, while Noel Delos Reyes and Mark Pascual collected 2nd and 3rd. Bracket R winner Rafael la O' also qualified on pole for the 10-lap GT Radial Grid A race. But he dropped down the order in the scuffle during the opening laps, allowing Eduardo Suiza to jump to the lead. However, this was also short-lived when Dondon Portugal in the #151 Mitsubishi Evolution 7 took 1st place in the race's closing stages. La O' worked hard to finish in 2nd, while Suiza had to settle for 3rd. As for the drivers in KYB Grid B, no one could catch Aaron Lao in the #84 Honda Civic EK who crossed the line with a 49 second advantage. Slalom veteran Peewee Mendiola returned to circuit racing and finished 2nd in the #47 Mitsuibishi Evolution 6 with Hector Tan following close behind in 3rd. It was a head-to-head battle between Sherwin Bargos and Polo Bautista in SmartFuels Grid C after Ed Christopher Go didn't make it to the starting line. Bargos finished 1st who was 7 seconds ahead of Bautista's #28 Carmudi Honda Civic EG. Combining Recaro Grid D and Works Bell Grid E formed a big 25-car race. As much as 5 drivers at any given time where fighting for the lead in Grid D, swapping places on every lap. The fastest of which was Mark Erwin Bayan in the #228 Mitsubishi Lancer finishing in 1st with a slim 0.321 sec lead. 2nd was Robbie Alvarez and 3rd was Jack Saquilayan. Robert Tan drove a Toyota Yaris in Grid E as a temporary stand in for his Corolla. But this didn't stop him from claiming 1st by a huge 6 sec margin. AAP Motorsport Development Program graduate Paolo Santos was 2nd, while Andre Makkina Tan took the last step of the podium. The FlatOut Race Series (FORS) resumes racing in less than a week's time. It returns to the Batangas Racing Circuit for Round 2 today.